« 2 More Big Newses until the end of the year. 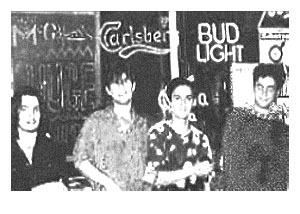 Way back when, long before there was a place called Git-Mo and I was just a boy and not a prisoner there was an obscure pop-punk/pre-emo/neo-garage-psych band called Huge who played around New York City from 1991-1993. Well thanks to someone’s new VHS/DVD recorder, Huge lives on into the new digital decade. Some of you were just pups when there was a lonesome acting student name Gregg Lopez (then using the waspy actor-name “Sutton”) prowling the east village drunk on infatuation and Olde English 800. So here we have two clips, one synced to our demo (like a real video) and the other the raw live sound. this was only their second gig and there was no sound in the singer’s monitor and thus the vocals are badly off pitch. Oh well. This entry was posted on January 8, 2008 at 7:56 pm and is filed under Announcements, music. You can follow any responses to this entry through the RSS 2.0 feed. You can leave a response, or trackback from your own site.